There was that point you got to when playing the original NES when your thumb started to get ever so tender, then began getting tougher. The gamer’s callous is a real thing, I can attest to it. Once you build one up, you can mash as fast as you like with no fear of thumb fatigue. 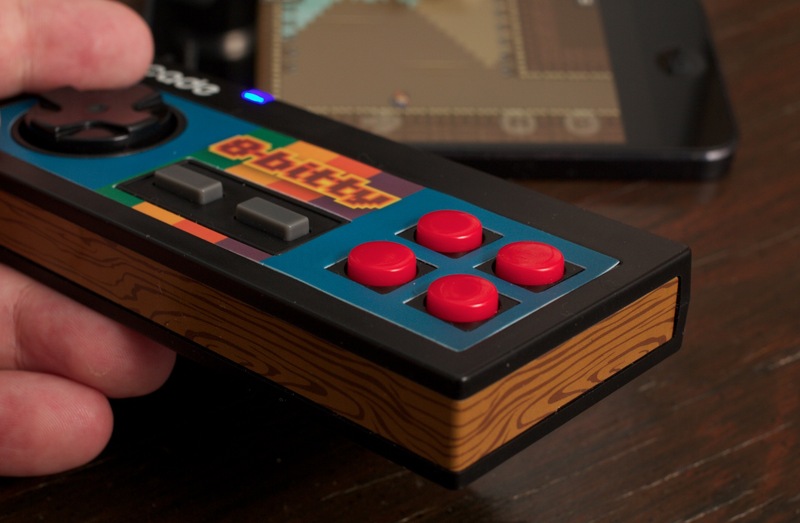 Well, get ready to build your callouses up again, because the 8-Bitty controller from ThinkGeek is a solid peripheral that should be a great buy for any retro game lover. It’s a NES inspired controller under the iCade brand that lets you play one of the hundreds of games that’s compatible with its control scheme. The physical buttons make all the difference for twitch gameplay titles like my perennial favorite League of Evil. 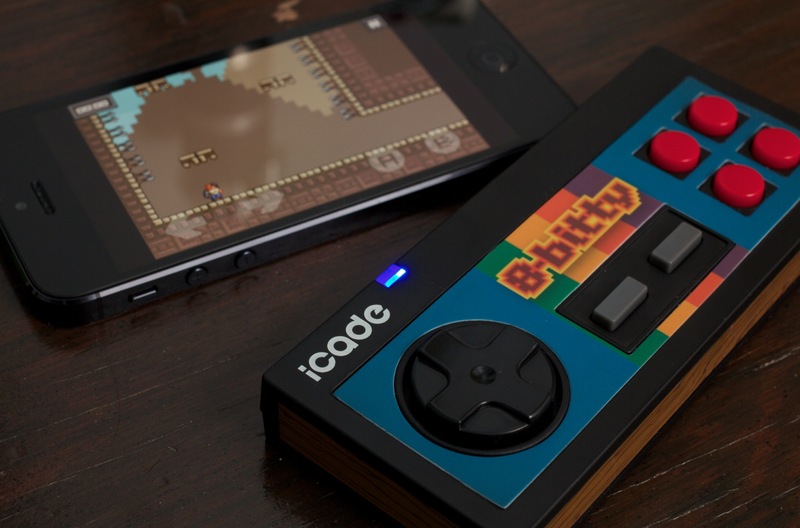 The 8-Bitty is a new entrant into ThinkGeek’s lineup of iCade controllers. This all began with an April fools’ joke a couple of years ago, when ThinkGeek posted a fake arcade cabinet for the iPad. It was in such a high demand that they actually ended up producing it, and it’s pretty cool. You can check out my full review of it from last year here. 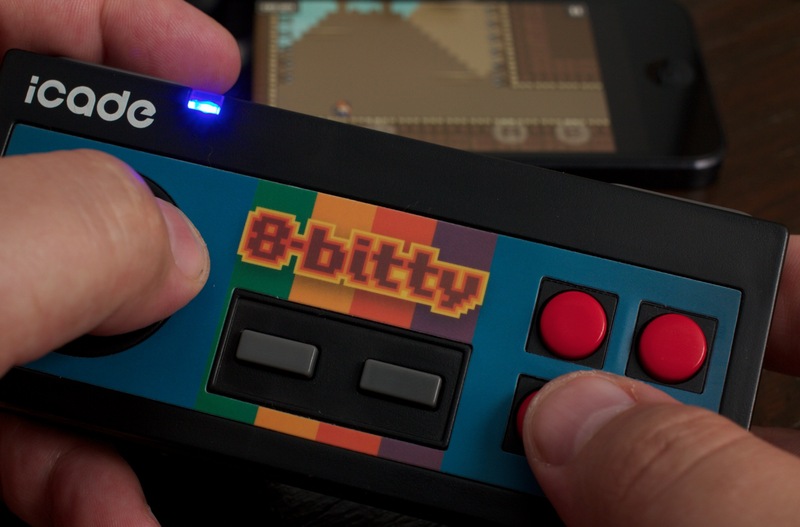 The 8-Bitty packs that down into a tiny candy-bar sized package that connects via Bluetooth to your Android or iOS device. It acts as a keyboard, so it should work with nearly all devices just fine. Whether it works with a particular game, however, is a matter of whether the developer has added support for it. The keys that it uses (one for press, one for release) to trigger actions have to be mapped by the developers of the game, it won’t just ‘work’. The list of supported titles has grown immensely since I reviewed the iCade cabinet. You can find hundreds of them on the iON site here and many more on the Open Pandora foums here. Many of my favorite titles now support it. The build quality of the controller is good. I can’t vouch for the longevity of it yet, as I’ve had it a few days, but it seems good. Nintendo was always famous for building their (early stuff anyway) controller hardware to stand up to some major abuse and still work. I’m not sure how much beating the 8-Bitty will take. The top label with the 8-Bitty logo on it, for instance, has a tendency not to stay stuck down, which is unfortunate right out of the box like this. The action on the buttons is pleasant, though, with a smooth action and a deep enough throw to get that nice tactile feedback that is so, so very lacking with a screen. The D-pad uses the typical ‘Nintendo patent avoiding ‘cross+circle’ design, and feels discreet enough not to accidentally fire off in the wrong axis. There are two top buttons as well, for a total of 8+D-pad. The key combos for the buttons come in pairs: “dc aq xz we kp lv go Im hr jn yt uf.” That means that it won’t work with your computer games, unlike the iControlPad, which has a switch to make it work with a single keystroke. I wish that the other mode was available, because most games on the computer wont work with two strokes being sent nearly simultaneously. But for mobile games that are compatible (which costs nothing, and is fairly easy to implement from what I’ve heard) that shouldn’t matter anyway. I’m really enjoying the 8-Bitty so far, but there is one side effect of using it that I didn’t see coming: many action games feel ‘too easy’ now on iOS. These games, no matter how tough, were designed with touch screen tolerances in mind and mashing glass will never give you the speed, accuracy or deftness of action that buttons and a D-pad will. League of Evil, for instance, gets devilishly hard at higher levels, basically requiring that you memorize fingertap timing to get through them. I’ve beaten almost all of the levels in the original game via touch, and it was very, very hard. With the 8-Bitty, those same levels are, if not exactly easy, much less difficult to beat. The controller eats up that differential that is built into the game in order to make it possible to play with a touchscreen, and gives you an edge that you wouldn’t have otherwise. If you’re a huge retro or arcade gamer on iOS, the $30 bucks for the 8-Bitty is a great investment. It might make some games a lot easier than they used to be, but it will likely make most of them feel a lot better to play as well.